Fresh improvements to get Molecular Weight Distribution (MWD) and Rheologically Effective Distribution (RED). We get only some dozens datapoints with single frequency sweep or capillary measurement. Fortunately specially oscillation rheometer is itself rather sensitive. The geometry of polymer sample can still vary during a single frequency sweep run, which may be more severe error source. 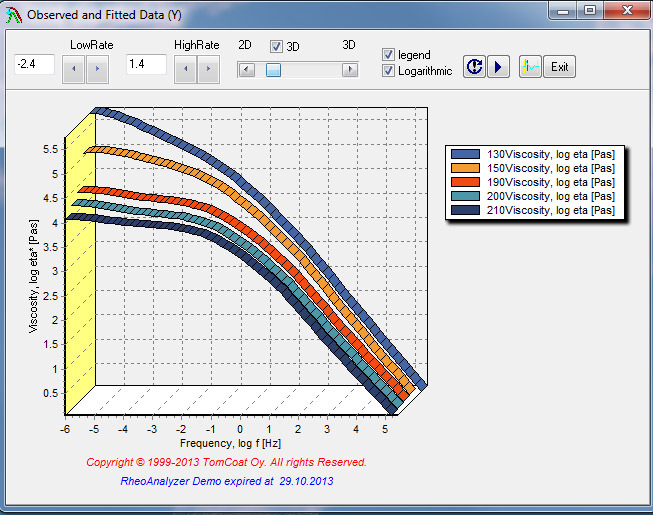 The absolute viscosity values vary between separate measurement runs due to variation of sample dimensions, but that is not problem for elegant RheoPower principle as it uses only relative data values at different rates or frequencies. Multi-Record Analyze results for several MWDs. Solution for the problem is to use several frequency sweep runs carried even at different temperatures, where new one click importing of XML records makes complete procedure fast and easy for multi-record analyzes giving higher accuracy for the MWD/RED results. The same principle is valid with data gained with other type rheometer and measurements. Already has been possible to give priori information for MWD, but now is possible to join data from different sources. 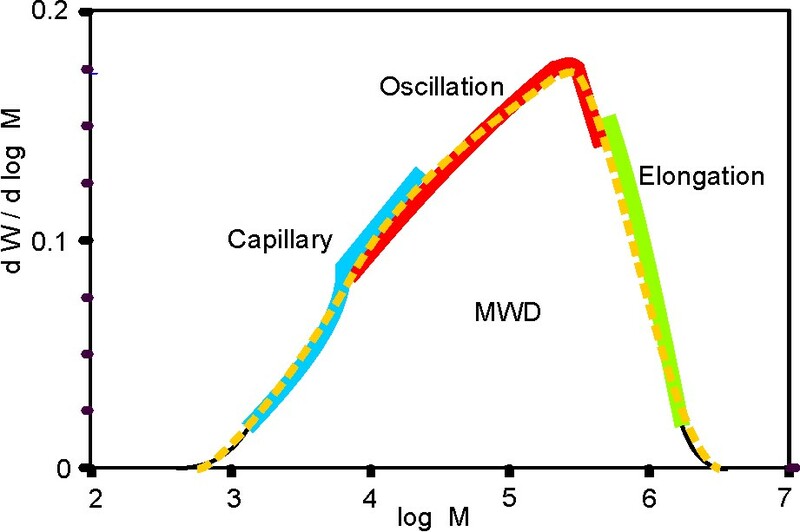 According to linear RheoPower principle is possible to convert viscoelastic data on different scales to MWD by using procedure depending on the structural factor Mf and flow transition factor Hf. Multi-Record Analyze is now as default in Premium version distribution package. Earlier Go-mode of Computation is available as option as although procedure is elegant, used a lot of numerical procedures and efforts in the developing work, the lack of measured datapoints makes computation procedure labile in the many cases. 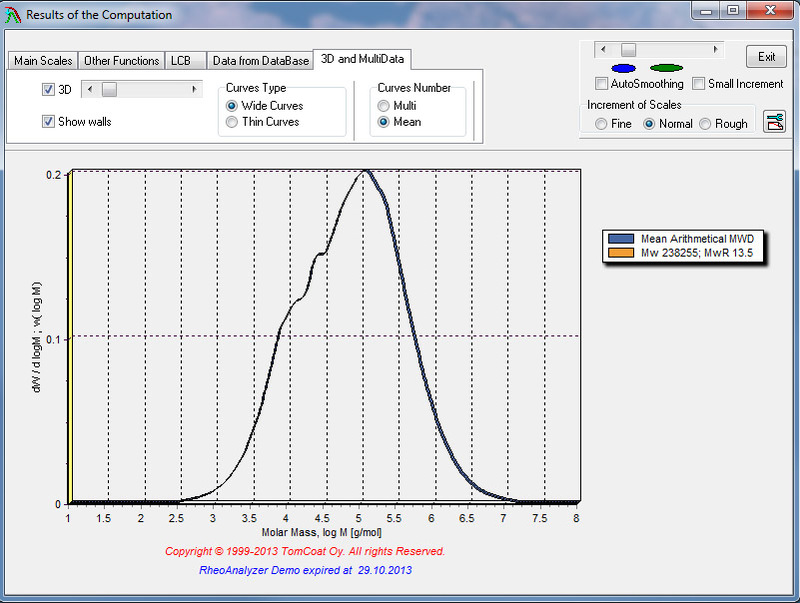 The drawing illustrates result generation by Multi-Record Analyze. Jointing data records from different devices and sources prodecude different segments for a wide LDPE MWD. Narrow MWD is detected completely in a single or similar measurements done by an oscillating rheometer. Multi-Record Analyze modeles several complex viscosities. 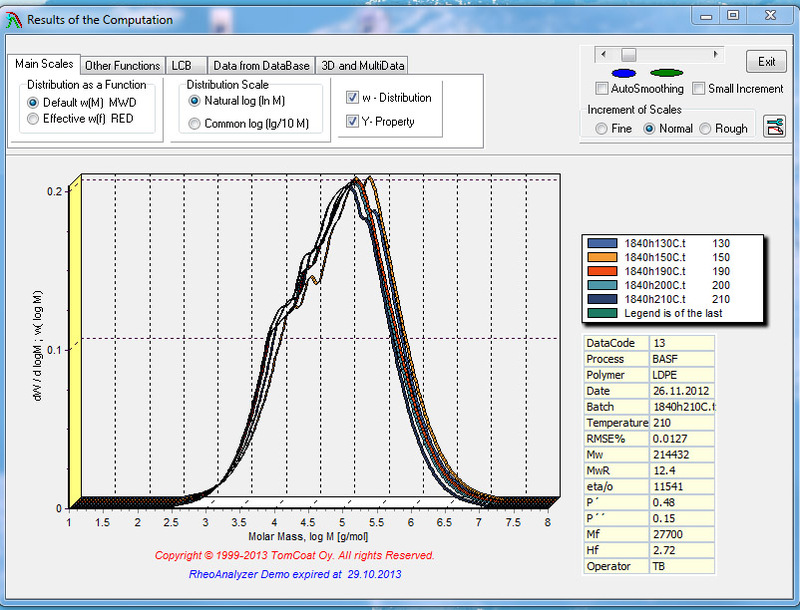 Multi-Record Analyze result for the complete mean MWD.